Modern fittings, like radiators, really kill the Gothic look. By fitting a well designed radiator case like this you instantly add the Gothic feel back to the room. They add a very stylish & authentic Gothic feel to any room. 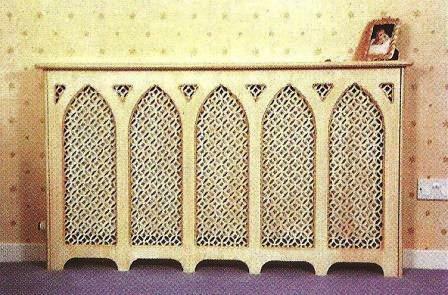 The length of your radiator will dictate the number of lancet arches used. Made from MDF (for heat stability), they can be finished to your required colour. They allow easy access. We will quote for size required. Ref SCO1. Made to order.